City-based designer label Aravind Criton is creating conceptual luxury fashion and awareness all for the cause of research in the field of breast cancer. Aravind Criton caters to women who love to indulge in eclectic luxury. The garments are intricately made with tailoring techniques and style patterns that are studied for long. Even the designs go through extensive research and priority is given to high-quality raw materials, to bring out the best in the garments. With the launch of this range that aims to support research in the field of breast cancer, Aravind Criton’s Battle Against Breast Cancer collection largely features twenty workwear shirts in extravagant cotton fabrics, suited for the Indian summer — effortless and easy. The collection maintains a perfect balance of luxury, concept and design to cater to the “thinking woman for whom movement is a form of expression.” It also pays attention to rich textiles with intricate surface embellishments to create timeless pieces that can be worn generations over. Their white, crisp collared shirt with minimal cut-outs featuring high-quality fabric for that perfect texture detailing, some with a mild essence of chic and others with curved hemlines bring out the craftsmanship and amount of care that has gone into hand-making them. Battle Against Breast Cancer is a sustained effort and not a one-time initiative. Along with the formal shirts, their autumn/winter collection is also up, which features western apparel in beige, tinges of yellow, black and even a neutral palette. Intricate modern art in a mix of colours that look uncannily like bubbles, adorn a top with cape, and fringe detail that runs along one side of a single-shoulder cape are things to love. We’re also digging a gorgeously glamorous set of separates that comes with a crop top embellished with sequin and glass-tubes, and a matching structured skirt. 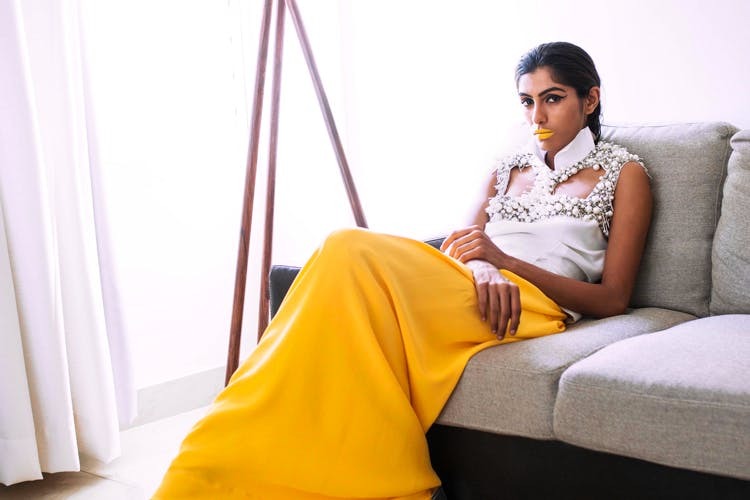 Aravind Criton’s autumn/winter collection, which appeals to the modern Indian woman, looks to raise funds to support research for breast cancer.